LyricsTraining is an easy and fun method to learn and improve your foreign languages skills through the music videos and lyrics of your favorite songs. And it is easy and fun indeed: find the video of a song you like, select your “Game mode” (this determines how much of the text gets left out that you have to add), and start listening. The video stops when you stop typing, so you don’t have to worry that you can’t keep up with the music. You can even replay any line as many times as you like. Your attempts will be timed and your score will also depend on how many words you skip. The videos are marked easy, medium or hard, so you can choose your level. No login or registration is required, but if you do so, you can compete with your friends and compare your scores. 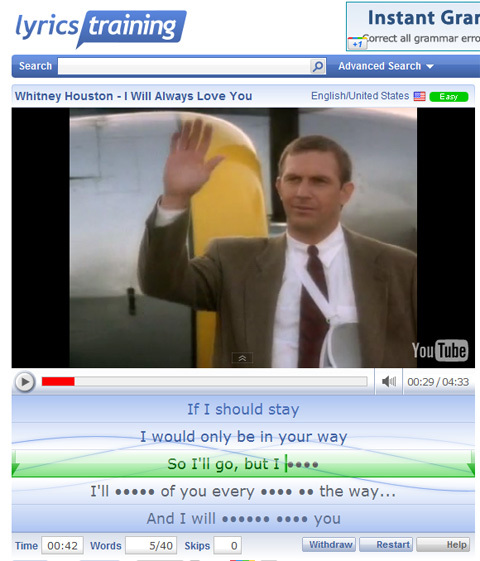 I want in this site to see short movies and songs by titel to teach English.